It’s 2018, always, the Strikethrough Gmail option is not available. 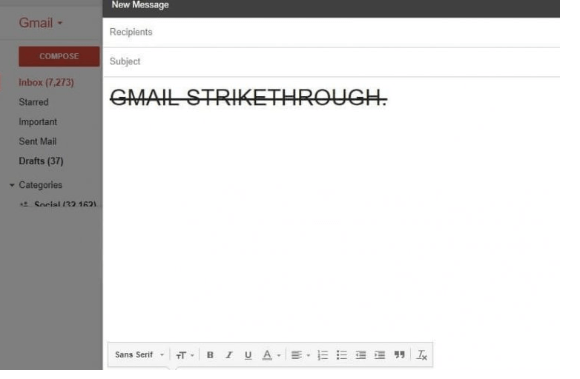 Maybe you’ve already found a way to Strikethrough the text in Gmail. But if you’re looking for simpler solutions, this article is for you. If you work online, you already know that text formatting is very useful. The Strikethrough is part of the typographic presentation. In strikethrough, a horizontal line crosses the text. But the text is still legible. 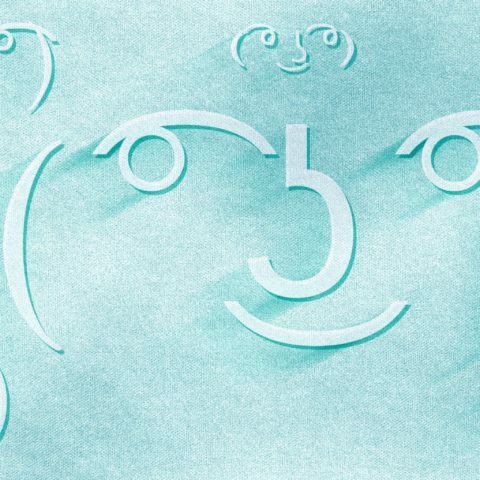 Well, I do not need to mention Strikethrough uses So, without wasting time, let’s start this article. Let’s begin this list of “Gmail text with an easy method, if you do not have time to download and use the script, this method could be useful. 1. Copy the strikethrough text and paste it into the “Gmail Compose” box. Select and copy this text. 2. Move the cursor next to this strikethrough text. And now, start writing what you want. As you can see in the screenshot below, the text written after the Strikethrough text will also appear in strikethrough format. After writing, you can delete the copied word. IMPORTANT – (Delete strikethrough format) Once this operation is crossed out, anything you type will appear in strikethrough format. In Gmail, you can remove the format by pressing Ctrl + \ at the same time. Then, to start writing normally, you must select the text and press “Ctrl + \”. Method: 2 Use the inspection element. If you’ve already written basic HTML, you’ll easily understand this method. 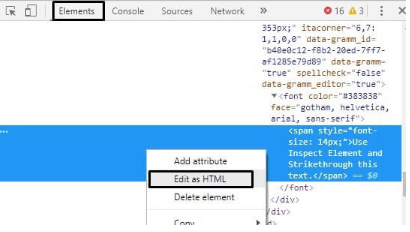 In this method, we will add a Strike HTML tag using the inspect element. This method is reserved for computer users. If you use an Android or iOS device, you can try the previous or next method. 1. In the Chrome browser, select the text you want to Strikethrough in Gmail. Right, click on the text you want to make Strikethrough and then click “Inspect element”. 2. On the right side of the screen, you will see the Inspection elements window. In addition, some lines of code will be highlighted. Otherwise, select the text again and use the check option. 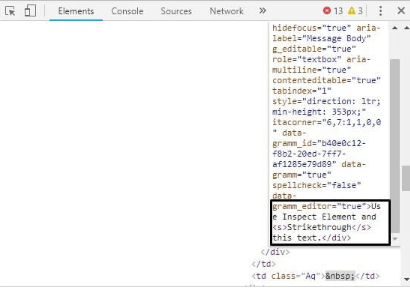 Right-click on highlighted text and select”Edit as HTML”. 3. Now, in the small edit window, you can see the email that you have written. All you have to do is add an open and closed tag before and after that word. Note: In the HTML tag, “S” is used for Strike. This method of “Gmail Strikethrough ” is complicated for ordinary computer users. But if you understand this method. So, you will always use this method. Method: 3 Use Google Docs. Many blogs and technical forums have already suggested this method. And I think this method deserves to be mentioned. In this method, you have to write the text in Google Docs. Next, use the Strikethrough Google Docs option. Then you can copy and paste the text in Gmail. You can also write a complete the mail in Google Docs. Then you can paste in the Gmail Compose box. 1. Open the “Google Docs” site and log in your Gmail account. 2. Click on the “+” icon to open a new document. 3. Now write what you want and select it. Then, after selecting the words, go to Format> Text> Strikethrough. You can also press the Alt + Shift + 5 keys at the same time to enable and disable Strikethrough. It’s all Now copy the text “Gmail Strikethrough ” and paste it. Although, the first method is better than this. 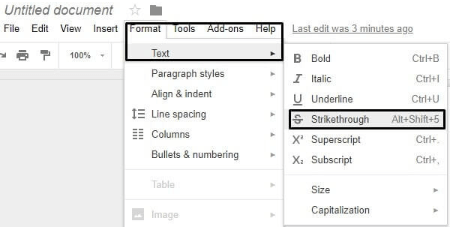 So these are the methods to use Strikethrough text in gmail. Some method may look little complicated. But you can always use which is convenient for you.